Knowing the advantages and limitations of different welding techniques is essential for professional welders. The unique properties of FCAW gives it a few advantages over other techniques. Flux-core arc welding (FCAW) is an automatic or semi-automatic electric arc welding process. In practice it is very similar to MIG welding, in which both use the filler wire as an electrode for the arc. Some of the same equipment can even be used for both MIG and flux-core welding. However, the filler wire is what makes the process unique. The filler wire in FCAW is hollowed out and filled with flux. Instead of using a shielding gas to protect the weld, the flux itself shields the weld pool and coats the entire weld. This coating also allows the weld to cool more slowly, which creates a more stable weld. The unique properties of FCAW gives it a few advantages over other types of welding. Because it contains its own shielding method, it does not need an extra gas tank, giving it increased mobility. However, this method also produces more smoke than MIG welding, so it should be performed only in highly ventilated areas or outdoors. Fortunately, the flux is shielded by the wire from environmental conditions, so wind does not impact the quality of the weld as it might for other types of welding. Flux-core welding offers greater penetration, which is good for working with thicker joints. It also allows the welder to travel in all directions and hold the torch in a number of directions. 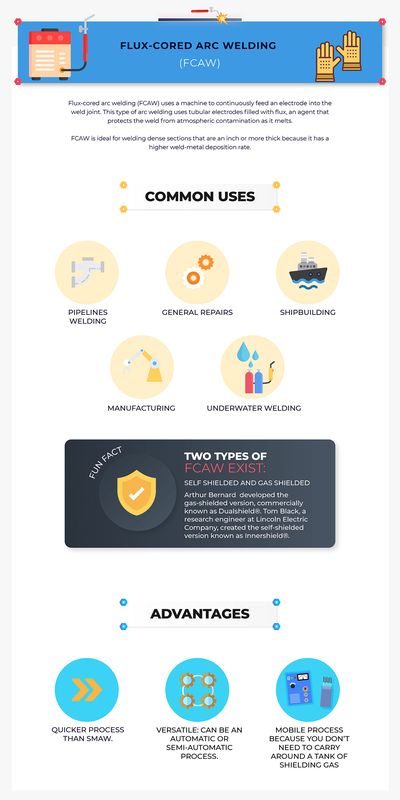 This makes it particularly suited to general repairs, shipbuilding, and other types of manufacturing. Flux-core welding does not need a high skill level to perform. After a welder learns how to properly set up the equipment, the technique for actual welding is relatively simple and easy to learn. The deposit rate of filler material for flux-core welding is the highest of any other method. While a MIG welder can deposit up to 8 pounds of wire per hour, a flux-core welder can deliver up to 25 pounds per hour. For big projects with tight deadlines, flux-core welding can be a saving grace, particularly in industrial manufacture and repair settings that process large orders. Counter to most welding practices, flux-core welding does not need to be used with a clean joint. As long as moisture, paint, and oil are removed from the weld site, this type of welding can burn through rust, mill scale, and other imperfections. Knowing the advantages and limitations of different welding techniques is essential for professional welders. To learn trade skills and other industry knowledge, contact Tulsa Welding School and receive information about welding vocational programs in Florida and Oklahoma.